WGLT is nominating its series of 2018–2019 Community Conversations and Election Forums for consideration of the Civic Engagement: Unit Award. Through a series of 11 events, WGLT engaged more than 1,700 event attendees and reached an extra 25,000 people digitally as it breaks down and engages around vital community issues. In spring 2018, WGLT received a Fell Trust grant for our Community Conversation series. The goal was to launch an ongoing series of events highlighting issues beyond local elections and the state budget crisis, which GLT had hosted in the past. The aim was to cover timely topics such as the rise in community gun violence. WGLT public radio is an NPR member station licensed to Illinois State and has been a part of the School of Communication since 1997. Since GLT received the Fell Trust grant, it hosted the following Community Conversations: “Gun Violence,” “Journalism in a Fake News Era,” and “Youth Mental Health.” A fourth event is planned for spring 2019. The events brought together more than 15 community partners and drew nearly 500 attendees. The conversations reached beyond the physical events themselves via video streams, which drew 1,140 unique viewers on average, with 22 average peak live viewers, plus 450 users reading recap stories about the events. 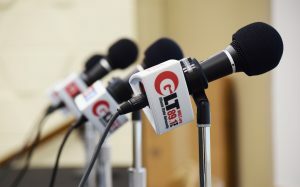 WGLT has a long history of hosting local election forums. “We’ve partnered for years with the League of Women Voters to help make sure our events reach the largest community possible to educate constituents before they vote. WGLT is the only neutral, consistent, community voice hosting election forums,” McBride said. In total, the forums highlighted nearly 30 candidates and drew more than 1,200 attendees. The forums reached beyond the physical events as well, with Facebook Live video streams drawing 2,100 unique viewers on average, with 59 average peak live viewers, plus 500 users reading recap stories about the forums. Visit the WGLT website for information about programming, news coverage, archived stories, photos, and more.